Are you struggling with missing teeth? Do you have loose dentures? You may be a candidate for dental implants. Implants offer solutions for common dental challenges in the replacement of missing teeth. Dr. Keith Crummey and Dr. Jenny Nunez have advanced training in the placement and restoration of dental implants. Tooth replacement procedures, including dental implants, replace the lost function of missing teeth and help preserve bone health. When one or more teeth are lost, it is best to maintain the remaining space with a dental implant, dental bridge or partial denture. Otherwise, over time the adjacent teeth shift toward the empty space, resulting in bite misalignment. This creates unnecessary pressure on healthy teeth that can structurally weaken them, leading to more dental problems. Dental implants are tiny cylinders made of surgical titanium that are inserted into the jaw bone that act as a foundation for a crown. Implants not only maintain the space between teeth, but also act as an artificial root to aid in maintaining healthy bone levels in the mouth. 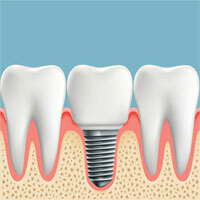 A single dental implant can usually be placed in the location of a missing tooth without affecting adjacent teeth. Joint pain and bite problems caused by the shifting of neighboring teeth can be resolved. Dental implants can help stop the cycle of tooth loss by eliminating unnecessary stress on the remaining teeth. 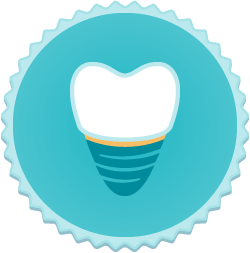 Denture patients can benefit from dental implants too! Loose, uncomfortable dentures have been a major challenge for patients. Implant-stabilized complete and partial dentures offer a remarkable solution to address chewing and speech problems resulting from ill-fitting appliances. Our dentists will work with you to develop a treatment plan for implant placement and fabrication of a replacement denture. Your new denture will "snap" securely onto the dental implants, but will still be removable for cleaning. The added stability will allow you to eat, laugh and smile again with confidence. If you have questions about whether dental implants are the right solution for you, we're here to help. At this initial consultation we will evaluate the health of your teeth and gums and talk with you about options to restore your smile. We will guide you through the treatment process and answer any questions you may have regarding the procedure, sedation options or financing. Schedule a personal dental implant consultation to get started.